Even with the best attempts at budgeting, there can be times when student flat mates are staring at a dwindling food fund, some time before they are able to top it up again. This calls for ingenuity and resourcefulness if you are not to go hungry, and you will be surprised what might be conjured up from leftovers and staples in the food cupboard. So, assuming that you still have something left in the fridge, freezer or store cupboard to work with, you can delay that call home for emergency supplies. There are often leftovers of starchy foods like mashed potato, rice and pasta. These are useful as long as you cover them up and refrigerate them immediately after the meal for use the next day. Leftover rice and pasta can easily be used as the basis for salads, especially in warmer months. Canned tuna and chickpeas from the store cupboard, combined with cucumber, tomatoes or sweet corn will make a little go a long way. Rice and pasta can also be reheated in a sieve placed over a pan of boiling water for a few minutes. Fluff it up with a fork occasionally as it heats. For a simple meal made with leftover mashed potato, spread the potato out in a heatproof dish, cover with some grated cheese and grill it. Alternatively, put the mash into an ovenproof dish and make a few dents in the surface. Break an egg into each one. Put the dish in a hot oven and bake for at least ten minutes or until the eggs are set as you like them. It helps if you keep a good stock cupboard of basic items which are cheap but versatile, such as tinned tomatoes and beans, and packets of noodles and frozen pastry or pizza bases, because you will have the makings of a meal to keep you going. 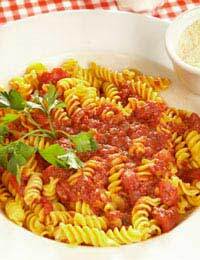 For a cheap tomato sauce, using tinned tomatoes, fry a chopped onion in a tablespoon of oil, until softened. Add a 400 gram can of chopped tomatoes and boil the mixture for five minutes. Add salt, pepper and some herbs if you have them, and pour the sauce over leftover, reheated pasta. Add some steamed, fresh or frozen vegetables if you have them. It’s an idea, while funds are still healthy, to have the odd day when you use leftovers to help spin out your money. You can have a very tasty meal using inexpensive ham hocks and still have enough left over for a second meal. On the first day you could serve slices of ham with mashed potato and green vegetables. The ham can be boiled or baked and should be cooked slowly with either method. If boiling, cover it in cold water and remove any scum when the water boils. Turn the heat to a simmer and cook till tender. If baking, preheat the oven to Gas Mark 4 (180 degrees C) and wrap the hocks in foil. Cook for 20 minutes then add on 40 minutes for each kilo. You’ll find many uses for leftover ham - diced and added to pasta and rice dishes; or added to vegetable mixtures in pitta pockets; or with beans to top baked potatoes. Carrots are at their best in a cool, dry place for only two or three days. So consider making carrot soup before they are past their best. Peel and chop the carrots and boil them with chopped onions in a stock made with vegetable cubes. Liquidise, season with salt and pepper and you have a quick and tasty soup. It’s more than likely someone will have a liquidiser, if only to make nutritious smoothies. Fish cakes are a good way to use up leftover fish, although the potato should be freshly boiled and mashed to make it easier to handle. For every 225 grams of fish use 225 grams of potato, a tablespoon of milk, salt and pepper, a beaten egg and 75 grams of breadcrumbs. Some chopped herbs would add to the flavour. Mix the cooked, flaked fish with the mashed potato, milk and herbs if using. Shape the mixture into patties and dip them first in beaten egg and then in breadcrumbs before shallow frying them for 3-4 minutes each side until golden brown. A packet of ready-made pastry is a good freezer stand-by. Roll out the pastry according to instructions and cut it into rounds to line individual patty tins. Bake them in a hot oven filled with whatever leftovers you have. Leftover vegetables or baked beans are good topped with mashed potato; or you could fill the pastry cases with leftover, cooked mince. Whenever you are cooking mince, make it go further by adding lots of vegetables to the mix, and chances are there will be some left over.